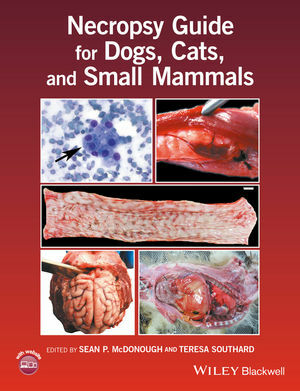 Necropsy Guide for Dogs, Cats, and Small Mammals is a complete, practical resource for performing necropsies on dogs, cats, rabbits, rodents, and ferrets in the veterinary clinic, animal shelter, research laboratory, or in the field. Sean P. McDonough, DVM, PhD, Diplomate ACVP, is an Associate Professor at Cornell University’s College of Veterinary Medicine in Ithaca, New York, USA. Teresa Southard, DVM, PhD, Diplomate ACVP, is an Assistant Clinical Professor at Cornell University’s College of Veterinary Medicine in Ithaca, New York, USA.